Winter got you down, craving the warmth of home? Feel down no more and hop on that bike. It’s time for a February challenge designed for the utility cyclist with lots of errands to do, even in wintertime– the Errandonnee! If you are a cyclist with places to go and people to see, this challenge is for you! Since we must run errands, anyway, let’s take the opportunity to acknowledge the utility cycling we often do, but seldom celebrate. Conceptually, these two words may not initally fit well together, but string 12 errands together for one long ride interrupted by sleep and other diversions, and you have… an errandonnee. Technically, I suppose there should be an accent above one of those last e’s, but it’s too much work to find that character on my computer. Of course, a Chasing Mailboxes challenge can’t be too simple so I’ve added in some rules. These may initially look like a lot of rules, but I think after you read through them you will find this challenge to be quite manageable. Complete 12 errands from Saturday, February 9 through Wednesday, February 20. Complete the Errandonnee Control Card as you go. Based on one of the comments, I also created a Google Doc version, which you may find here. There is no minimum length for each errand, but you must complete at least 30 miles of bike riding over 12 days to successfully qualify for the Errandonnee. That’s an average of 2.5 miles per errand. There is no maximum number of errands you must complete each day, provided you complete all 12 by the end of Wednesday February 20. You can ride all 12 errands in one day, do one errand per day, or any other combination that works for you. 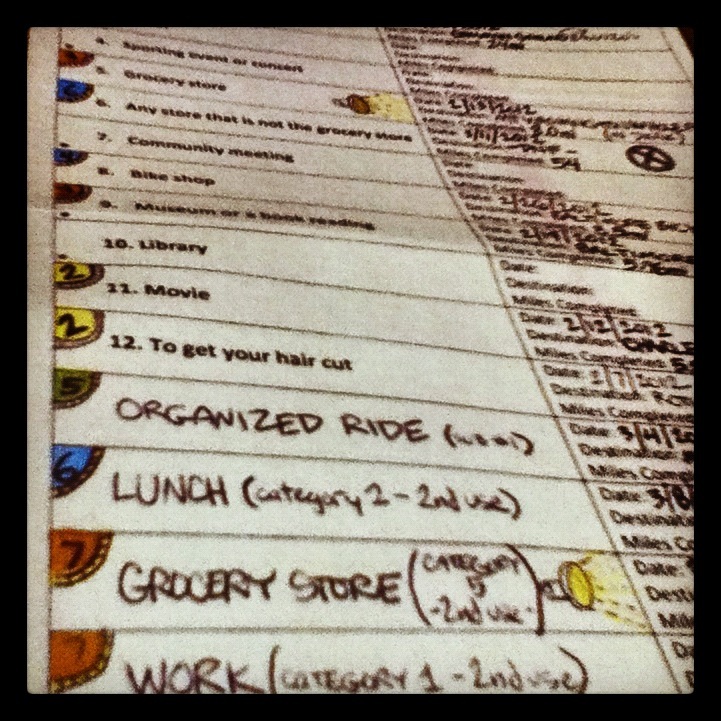 You must complete errands from at least seven of the 11 categories represented on the Errandonnee Control Card. At least two errands must occur after dark (or before daylight), and you must describe the lighting method used. You may also use a site like flickr or Picasa and link me to your photos that way as well. Finally, I will accept 12 photos via e-mail if that’s what works best for you. There are no geographic limitations on the Errandonnee. OK, Earth. All participants must be from somewhere on Earth. Deadline for Errandonnee submissions is midnight in your area, February 28, 2013. Submit all Errandonnee paperwork, including your Errandonnee Control Card to me at gersemalina “at” gmail.com. All qualifying rides must be submitted at the same time. That is, send me all 12 together, NOT ride 1, ride 2, etc. If you have been blogging or tweeting your errands, you can send me the links to those as well as the completed control card. Everyone who successfully completes the Errandonnee will receive a prize. Please include a snail mail address in your submission so that I may send your Errandonnee swag to you. Be prepared to be featured as a guest post on this blog if when you successfully complete this challenge. Also, please feel free to tweet as you go using the hashtag #errandonnee. Questions? Let me know in the comments or send me an email if you’re shy. The Errandonnee: February 9-20. It all starts Saturday. 12 errands in 12 days. Have fun and feel righteous while out doing errands on your bike. I know you can do it. 2/10/13 UPDATE: An additional Q&A post is here to address some of the questions people have asked. Thanks! Sounds a lot like utilitaire…. Yes, it is. I wanted to do something like the Utilitaire, but I felt it required too much vigilance to successfully complete it. The Errandonnee is more streamlined, shorter term, and (I hope) more flexible. Errandonnee control card link worked fine for me. I do have one question or clarification: Rule 6 lists work as an example of a category, but work is not included in the list of categories. Would I have to use a wild card for a commute to work? Ooops! My staff… what am I going to do with them? Updated the post and to include work as a separate category and will update the control card tomorrow. Whee! Control card downloaded. I just wish it were starting on Thursday; I have to go to the dentist and that would take care of half my mileage in one fell swoop. I can see I will need to get creative about this. Could dance rehearsal count as a wild card? Yes. You could include it in the “personal care” category, too. By the way: if on Windows, then alt-0233 on your numeric keypad yields the é. On a Mac it’s option-E, then e.
I think I may actually be able to do this! One question (I always have a question, don’t I? )- does mileage count one way? If I’m riding one (or more) errands and then go home, do I count the mileage going home, or do I just count the mileage to the errand(s)? You could actually count both toward the 30-mile total. When I was putting it together, I was thinking about average minimum distance round trip. ooh, I am even more excited after re-reading the rules more carefully. I don’t have to try to navigate Kansas City’s streets – I can just do more rides on the 9 days I’m here. There’s always the “Excuse me, can I borrow your bike for a few minutes?” method. I found that if I add the words, “It’s okay.” in a reassuring voice at the end of the request, it generally goes well. Brilliant! I love it. 😀 Thank you for running this lovely challenge. I’m already contemplating some rather wild wildcard errandonnees. I suggest “beer run” as a category. That would give me a fighting chance. Nice use of a classic Bridgestone! Right? Felkerino is proud of that setup, though it still needs a little tweaking! OK, if not, let me know. I will send you via email. Great! You may translate it for your site. I’m in, though I’ll have to pad every one of those categories to get my mileage up to 30. Small town life. Any bonus for carting children on said errands? No bonus miles for carrying children, though it does give you extra righteousness points. Most excellent. I believe Bike Arlington’s gathering at the Mardi Gras parade would clearly be a community meeting! And make for festive pictures! THANKS! Your second link, in rule #12 is missing the ‘1’ at the end of the file name “errandonee1.docx” and so gets a 404. The first link in rule #2 works. A mobile/smart phone format’d be nice – maybe a google doc or something? Pingback: The Errandonnee: It’s Starting | chasing mailboxes d.c.
Errandonee control card is downloaded, and I’m off for groceries on this blustery winter day! Aww, shoot, the “after dark” requirement. I’ll assume “before daybreak” would work as well. I guess I’ll have to get back to my pre-xmas habit of riding bike in a.m. darkness to the gym 2-3 days a week…. And P.S. I have a doctor appointment that’s five miles away on Tuesday…. I feel like I might be doomed for success this week. Yes, after dark also = before daylight. Going to update the post to state that. Good luck w/ the Errandonnee, and I hope you write a blog post about it! Question: If several different errands are combined in one trip, how do I break out the mileage for each? So for example, total trip = 13 miles, included 3 categories, how to indicate such on control card? I’m thinking of using the first category to record the total mileage and then saying “see #2” or whichever. What a great coincidence, seeing another errandonneur out and about! AND the hardware store… right on! I do not expect people to track miles from one errand to the next, unless that is something they want to do– only overall mileage for the day’s outing. Do organized rides count? They’re not really an errand but I see it listed in the picture of the Utilitaire control card. If you ride to the start of an organized ride, then yes it counts. 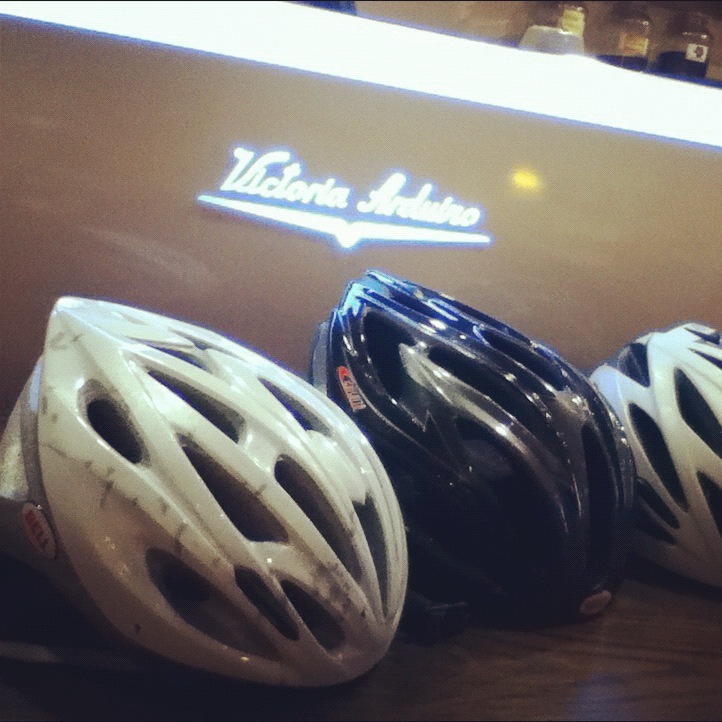 If it is an informally organized ride among friends, then it counts provided you all do something like stop for coffee or eat somewhere before or during the ride. Make sense? Pingback: Your Errandonnee Questions, Answered! | chasing mailboxes d.c. I don’t ride in the dark due to vision issues. Can I substitute riding in rain or drizzle? Yes, in your case, I will allow a substitution. Thanks, now if it will only rain again. Did I actually SAY that? My sweet son just said he’ll go with me in the dark if I don’t get soaked in time to finish, so I might just be able to pull this off! Hi, MG — I meet up with a couple of bike club leaders for easy, recreational rides, always involving coffee, food, and conversation. I bicycle to the train station, take the train into the city where the club is, bicycle to the meeting point, and then, of course, do the ride. Does this qualify as a coffee, lunch or wild card errand for purposes of this challenge? I guess technically it’s a formally organized ride, but there are usually only a couple or three of us on the ride, since it’s a low-speed, very casual ride. Pingback: Errandonnee Updates of the Twitter Kind | chasing mailboxes d.c.
Ooh! I know I’ve missed the start, but this looks like an amazing warm-up for 30 Days of Biking (starting April 1st). I’ll start today! Excellent. Look forward to reading your posts! I’ve already done the errands without even knowing there was such a thing as Errandoneering. Unfortunately did not take any photos. O well. I think most 10-day periods of my normal life would qualify. The wild card for go to daycare centre, school (major) or church…hmm I think to encourage parents and students, you might want to include daycare and school as a separate category as optional. Or visiting a nursing home which is what my cycling partner did for 3 years several times per week for his mother. I would say parents and students do deserve a category…and particularily parents who must do stuff dropping children off and picking them up…it is an effort that childless folks can’t fully appreciate. Not really. Good comment, and I will keep it in mind for the next go-round. Question: would you prefer the pictures embedded with each section of the control card, or as a link in each section? Thanks. Including it on the card as a link is perfect. Thanks, Joan! Pingback: Bikeleague.org Blog » Blog Archive » Get Ready for Bike Month Bingo! 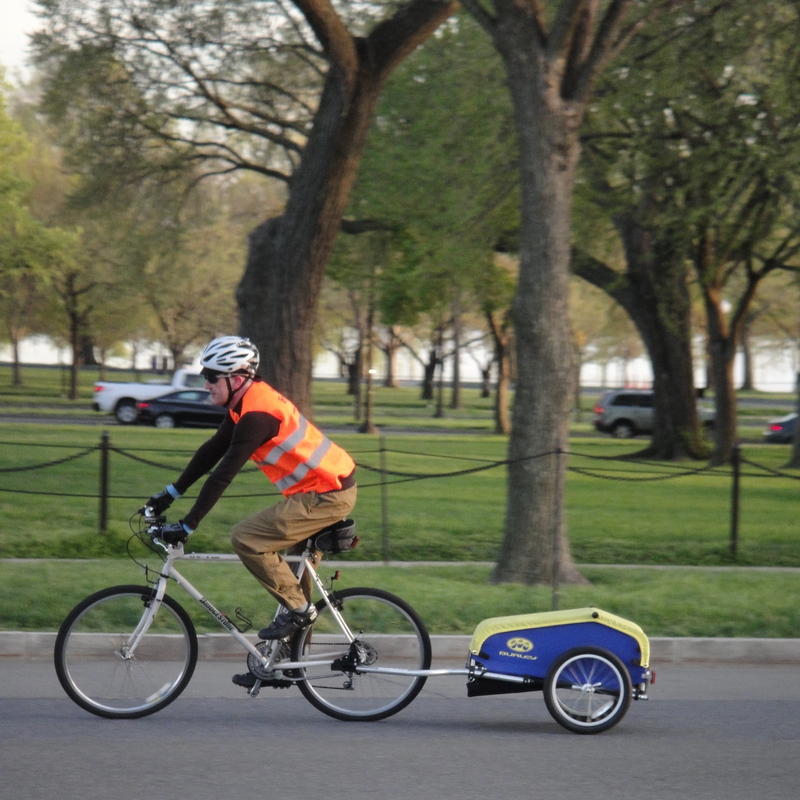 Pingback: 2013 in Review: Bike Rides (Mostly) and Photos | chasing mailboxes d.c.